The deadline for registration is September 10, but because the commemorative gifts must be ordered, we encourage you to sign up as soon as possible to make sure you get yours. FRIDAY, September 25 at The Riverside Hotel, 6:00 PM. This is the old Red Lion Riverside located at 2900 W. Chinden Blvd. A no-host bar is available and light snacks will be provided. SATURDAY morning golf will be available at the River Birch Golf Course. Both women and men are invited to play and Kent Scott will provide more details should you be interested in participating. You can email him at dscott699@yahoo.com or call him at 208-880-3771. 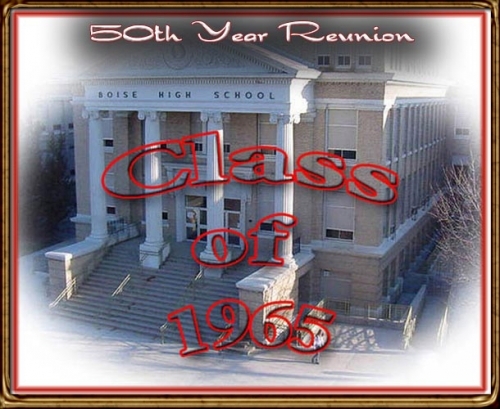 SATURDAY afternoon at 2 PM we will gather on the steps of Boise High School for a group picture. This will be a casual affair and the high school may be open for a tour. SATURDAY evening - will be held at a new facility in Eagle, about eight miles west of Boise. Maps will be provided at the Friday event. The festivities will begin at 6 PM and dinner will be served at 7 PM. The event consists of a pasta buffet in a casual atmosphere with the opportunity to reconnect. for this transaction from MyEvent.com*boisehighclas.